For the most up-to-date information about the status of our project, check our project updates on Kickstarter! How do I purchase Add Ons? Overpledge for the level that you've selected and during the "checkout" process during the post campaign survey you will be able to select your unlocked case, as well as any add ons that youv'e purchased. We're happy to use Backerkit for post campaign fulfillment. Are the dice metal? and how well balanced are they weighting wise? Yes, the dice are well weighted; they are solid and very satisfying to roll! Will these be available for Christmas? Yes, all rewards will be shipped in time for Christmas. 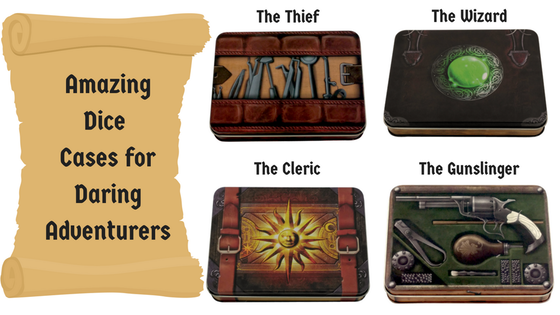 What are the dice cases made from? No shipping updates are provided. BackerKit is a service that crowdfunded project creators use to keep track of hundreds to tens of thousands of backers—from shipping details, pledge levels, preferences and quantities, whether they have paid or had their card declined, special notes, and everything in between! The BackerKit software and support team is independent from the campaign’s project team—BackerKit does not handle the actual reward shipping. For more information about the preparation or delivery status of your rewards, please check the project's updates page. After the campaign ends, the project creator will send you an email with a unique link to your survey. You can check out a walkthrough of the process here. BackerKit allows you to update your shipping address until the shipping addresses are locked by the project creator. To update your address, go back to your BackerKit survey by inputting your email here. I completed the survey, but haven't received my rewards yet. When will they arrive? As BackerKit does not actually handle any rewards or shipping, the best way to stay updated on the shipping timeline would be to check out the project's updates page. Why can’t I log into my account? BackerKit will send you an automated email with an invite link to whatever email you pledged with. I never received my invitation. How do I complete the survey? The most common reasons for not receiving a survey email is that you may be checking an email inbox different from the email address you used to sign up with Kickstarter, Indiegogo or Tilt Pro account, or it may be caught in your spam filter. Confirm that the email address you are searching matches the email address tied to your Kickstarter, Indiegogo, or Tilt Pro account. If that doesn’t work, then try checking your spam, junk or promotions folders. You can also search for "backerkit” in your inbox. To resend the survey to yourself, visit the project page and input the email address associated with your Kickstarter, Indiegogo or Tilt Pro account. When will my order be shipped, charged or locked? That is handled directly by the project creator. BackerKit functions independently of the project itself, so we do not have control of their physical shipping timeline. If you want to check on the project’s status, we recommend reading over the project's updates page. Can I upgrade or get multiple copies of my pledge? This depends on the project creator’s decision. If you are unable to see the ‘Want to switch your pledge level?’ after clicking on your pledge amount under “Pledge Level” in your survey, then the project creator would prefer people not to switch pledge levels. How do I purchase Add Ons? Are the dice metal? and how well balanced are they weighting wise? Will these be available for Christmas? What are the dice cases made from? I want to know when my reward is shipping. I am having trouble filling out my survey. I would like to make a change to my pledge. I would like help with preorders. I have a issue with my pledge finances. I have a question for the project creator. I have a question not listed here. I want a refund for my initial campaign pledge. I have a question about BackerKit.